* Annual estimated passenger usage based on sales of tickets in stated financial year(s) which end or originate at Partick from Office of Rail and Road statistics. Methodology may vary year on year. Statue of Bud Neill's G.I. 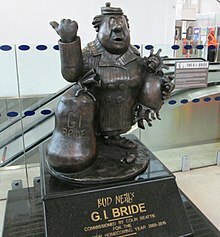 Bride character (and baby Ned) from his Lobey Dosser cartoon series, erected in Partick station in 2011 to commemorate her determined efforts to thumb a lift from the fictional Calton Creek in Arizona back to Partick. Partick station is an interchange station in the Partick area of Glasgow, Scotland. Along with an adjacent bus station, it forms one of the main transport hubs in Glasgow. The station is served by Glasgow Subway and National Rail services and was one of the first to receive bilingual English and Gaelic signs, because there is a significant Gaelic-speaking population in the Partick area. The first station in the area was the North British Railway's Partickhill, opened in 1887 slightly to the north of the existing site on the opposite side of the Dumbarton Road. Soon after, the Glasgow Subway opened and its Merkland Street station, slightly to the south of the existing station site, opened in December 1896. Neither was independently known as "Partick station" as there were two other railway stations in Partick between the late 19th and mid-20th centuries: Partick Central (later renamed Kelvin Hall station) to the east with Partick West and Crow Road to the west. The Beeching Axe of the 1960s closed Partick West and Partick Central, both on the Lanarkshire and Dunbartonshire Railway link to the Stobcross Railway and Glasgow Central Railway, leaving just the two stations in Partick, with Partickhill station - which escaped closure owing to being on the newly electrified (1960) North Clyde line from Queen Street Low Level, served by the 'Blue Trains', with a major pre-electrification refurbishment in 1958. It stood a few hundred yards north of Merkland Street. The amalgamation of the two stations to a single site came in 1979, as a major refurbishment of the Glasgow Subway coincided with the Greater Glasgow Passenger Transport Executive's decision to reopen part of the Glasgow Central Railway, which had been axed by Beeching, as the Argyle Line and connecting it to the North Clyde system just east of Partick. Both stations were closed (Merkland Street had been since the Subway works began in May 1977, whilst Partickhill remained in service for several months after the Argyle Line opened, until replaced by the current Partick station) and replaced by British Rail with a new combined Partick station in the middle. The platforms at Partickhill are still visible from the North Clyde/Argyle Line, although access to Dumbarton Road is now blocked. The Merkland Street station buildings are no longer visible. The station is one of the primary stations on the Argyle Line and North Clyde Line of the Glasgow suburban rail network. These lines primarily provide services to the east and west although the station itself is orientated north-south with two platforms. Statistically, it is the tenth busiest railway station in Scotland and the fifth busiest passenger interchange when subway and bus journeys from the site are included. Partick station is on a busy section of the Strathclyde rail network, served by all services on the Argyle Line and North Clyde Line. Eastbound Argyle Line trains serve Rutherglen and Cambuslang, before continuing to Motherwell, Lanark, Coatbridge Central via Bellshill or Hamilton Central, as well as Larkhall. Eastbound North Clyde Line trains operate to Edinburgh Waverley, Airdrie, Springburn eastbound, via Glasgow Queen Street. Westbound services operate to Balloch and Helensburgh Central via Dalmuir, and to Milngavie. Many journeys that interchange between the Argyle and North Clyde lines require passengers to change at Partick, as it is the closest station to central Glasgow with direct services to both Glasgow Central and Glasgow Queen Street main line stations. There were 15 trains per hour at opening of the Argyle Line in November 1979. There are a total of 14 trains per hour, off-peak, in each direction. The basic frequency still remains 14tph each way, but following a major timetable recast in December 2014 some routes have been changed. The main alteration has been the incorporation of the Whifflet Line into the Argyle Line timetable and the consequent removal of trains to Lanark via Belshill (passengers for those stations now have to change at Cambuslang or Glasgow Central, as they run to/from Central High Level). Springburn line services have now also been extended to Cumbernauld eastbound and Dumbarton Central westbound on weekdays, with an hourly service to Cumbernauld via Springburn starting/terminating here on Sundays. Partick subway station is one of the largest stations on the Glasgow Subway network, and has around 1.01 million boardings per year. This is due in part to its situation within the city and also the National Rail network. Partick is a relatively large population centre of Glasgow housing around 100,000 people, a significant number of whom use the subway to commute to the city centre. Furthermore, Partick station is an interchange for two lines on the National Rail network. People commuting from outside Glasgow to one of the areas covered by the underground network may choose to continue their journey from Partick to allow for ease of transfer between the services and to avoid a lengthy walk between (for example) Glasgow Central and St. Enoch. It is one of only three with a dual side platform layout (the others being Govan and St Enoch). The rest have either a single central platform covering both circles or two platforms with a track running at the same side of each. The new Partick station replaced Merkland Street, which was located to the south, after modernisation. It should not be confused with the old Partick Cross subway station which is now known as Kelvinhall and is the station directly preceding or following Partick, depending upon the direction of travel. It is the only station on the Subway that interchanges directly with a railway station, although Buchanan Street station is linked to Queen Street by a length of moving walkway. St. Enoch once shared this distinction, before its parent St Enoch railway station was closed and demolished in the 1960s. Partick is one of three subway stations on the SPT Subway line to benefit from mobile telephone service nodes, the others being Buchanan Street and Hillhead. These nodes allow users of the O2 cellular network to use their mobile telephones while waiting on a subway train. The idea was to trial the technology at the busiest stations and, if successful, to put similar devices at each station eventually extending service across the entire network. As yet, the trial is incomplete. Strathclyde Passenger Transport began planning an extensive modernisation of the Partick station site – which had remained largely unchanged since its opening in 1979 – as early as 1998. Work began in late 2005 and was originally scheduled for completion in January 2007. However, delays to the project resulted in this date being put back on a number of occasions. The demolition and construction work was carried out while the site remained open to avoid any disruption in rail and underground services, arguably one of the most ambitious attributes of the project. The total cost of the project was estimated to be around £12.3 million with professional fees and third-party costs accounting for £2.6 million of this. However, due to delays in the progression of the works and unforeseen difficulties – such as ground conditions on the land the station occupies, only discovered after the commencement of work – the company in charge of the development, C Spencer Construction, made a claim for a further £6.3 million. In early 2009, the project finally reached its conclusion and on 31 March, the new station was officially opened to the public. The work done includes the construction of a completely new and modern station building which incorporates a brand new ticket office (which has been in use since 2008). The station concourse has been completely renovated and new signs have been posted similar to those seen in Glasgow Central and Queen Street stations. Both railway platforms have been refurbished and now have their own indoor waiting rooms. Lifts linking the concourse to the National Rail platforms were installed. The Subway platforms were renovated between summer 2012 and spring 2013 at a cost of £1.2 million. All floor, wall, and ceiling finishes were replaced with new contemporary designs. Improved lighting, signage, and facilities for disabled people were introduced. Lifts linking the concourse to the Subway platforms were to be installed as part of this project because the necessary land is not owned by SPT. The future provision of lifts has, however, been safeguarded. ^ "Home at last! - Corporate Information - Strathclyde Partnership for Transport". SPT. 1 February 2011. Retrieved 20 March 2016. ^ The usage information (Station Entries and Station Exits) is based on ticket sales in the financial year 2002/03 and covers all National Rail stations. Continued usage notes Archived 4 March 2006 at the Wayback Machine, and Excel format table for all stations Archived 13 February 2006 at the Wayback Machine available. Wikimedia Commons has media related to Partick railway station.